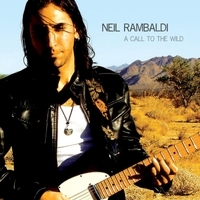 Review: "Rambaldi, Neil: A Call to the Wild" - Sea of Tranquility - The Web Destination for Progressive Music! It seems like a million years ago that we reviewed guitarist Neil Rambaldi's debut solo album Perpetual Horizon (2002 to be exact! ), but here we are a decade and a half later and the NJ born musician is back with his sophomore release A Call to the Wild. Now located in the Los Angeles area, Rambaldi has obviously soaked up some of the West Coast vibes for this new record, as the songs here contain a wealth of variety, tones, textures, and colors that show his musical growth since his debut all those years ago. While his technique is still quite stellar, evident by the acrobatic riffs & solos on the upbeat rocker "When the Days Were Young", it's his sense of emotion on the dramatic "The Day The Tides Stood Still", the Latin jazz & flamenco flavors of "Mi Corazon", and the gorgeous classical strains of "And the Sun Goes Down..." that reveals all the new tools in his arsenal. Of course, plenty of gritty hard rockers to be found, such as the molten funk of "Everything You Say", the driving blues-meets-Middle Eastern tones of "Shadow Armada", and the feisty shred of "Wild Seed", each one a sizzling vehicle for Rambaldi's serious chops of doom. The anthemic rocker "Brave New World" has a can't miss melody which almost screams for vocals (and some INCREDIBLE lead guitar! ), and the lengthy "The Sleeper" offers up tender piano alongside some scorching lead guitar solos. Much more than just an instrumental guitar oriented album, A Call to the Wild is still a feast for the ears for anyone who craves tasty & acrobatic six string dominated music. Neil Rambaldi not only has all the chops, but the songwriting skills to match them every step of the way. Highly recommended, and hopefully it won't be another 15 years before we hear from this talented musician again.